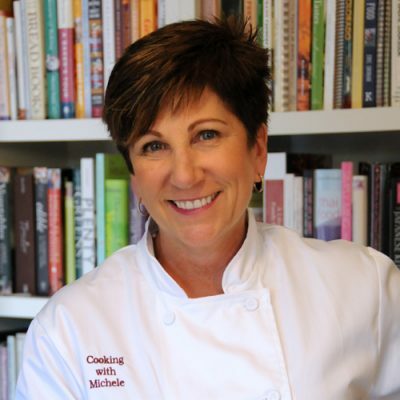 You might recall my last attempt with making pizza crust – while the dough tasted delicious, I wasn’t thrilled with the texture. I’ve read quite a bit about “00 flour”, which is a very finely ground flour that is high in protein, and is the choice of Italian pizza makers around the world. 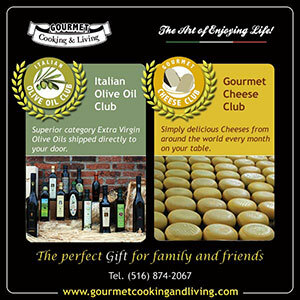 It’s not easy to find the specific brand favored by so many – Antimo Caputo – but thanks to the internet, you can order it online. Pizza recipes are pretty much all the same – flour, salt, yeast, water, and some extra virgin olive oil. But it’s surprising to me how different the proportions are from chef to chef. In the end, I made up my own ratios, and I was quite pleased with the results. I like a very thin crust, so rolled out 1 ball of the dough into a large (to fit a 12 x 14 rectangular pizza stone), very thin, crust. 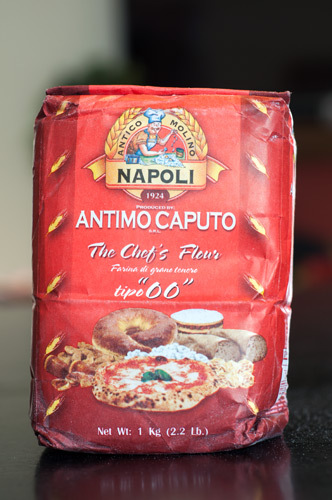 I sized this recipe to use one full bag of the Antimo Caputo flour, so it makes enough dough for 6 pizzas. 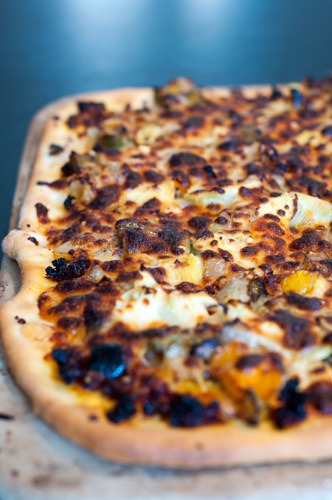 The next time I make one, I’m going to experiment with a thicker crusted, smaller pizza. I recommend cutting the dough into 6 dough balls after it has risen, rubbing them with some olive oil, and then placing them in ziplock bags to freeze. 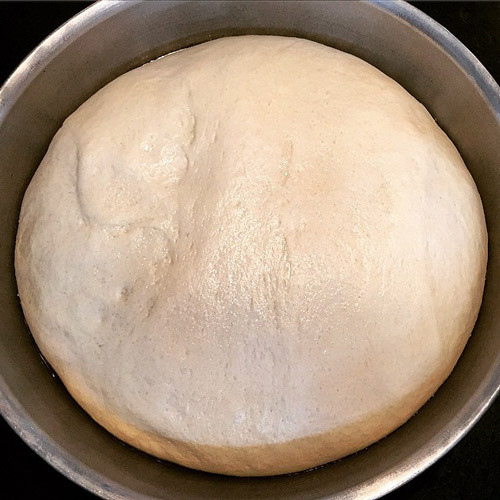 You can thaw the dough in the refrigerator overnight when you are ready to use it, and then let it rest at room temperature for 30-60 minutes before rolling it out for pizza. Place the flour and salt into a stand mixer with the dough hook attached and mix together for 30 seconds. Add the sugar to the warm water and then sprinkle the yeast over the warm water in the measuring cup. After a minute, gently stir it and then let it stand until the yeast is activated and has started foaming up, about 2 minutes. With the mixer running on low, add the yeast water and the olive oil and let the mixer run on low until the dry ingredients are incorporate. Turn mixer to medium and let the dough hook knead the dough until smooth and elastic, about 5 minutes. Remove the dough and shape it into a smooth ball. Place the dough in an oiled large mixing bowl and cover with plastic wrap, and place in a warm place to rise until 2-3 times the size, about 2-3 hours. Punch dough down and divide into 6-8 dough balls for pizzas. 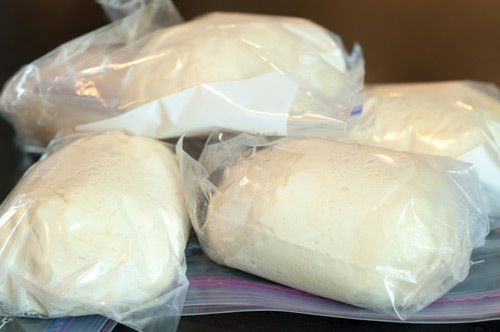 (Extra dough may be oiled and placed in freezer bags to freeze for another use.) Roll out dough and top with desired toppings. Bake at the highest temperature your oven will go until the crust is crispy and browned, about 15 minutes. 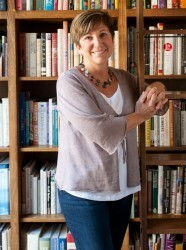 Not sure what you disagree with Gloria – I’ve made this recipe many times and it works for me. That’s not to say that other recipes online don’t also work! I would like to know if there is a difference between the all red bag of 00 flour and the red & white bag of 00 flour for your pizza dough recipe? I love the recipe. It is really good pizza dough. I don’t see an difference from the labeling on the bag – both by the same producer and both 00 and both soft wheat flour that’s touted as great for pizza crust.